Our next Top Dog interview is with Lilly an adorable Golden Retriever and therapy dog living in Germany with his parents and brother, Chicko, a rescue Golden. 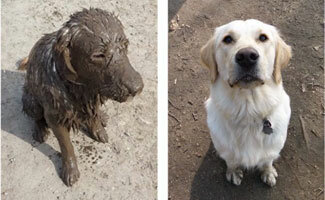 Learn what it’s like living in Europe, some of Lilly’s favorite pastimes (hint: it involves mud) and more about this sweet pup. Mom and dad felt so sad about the loss of their previous dog Luna. I never met her, but she was an absolutely amazing and beautiful 10-year old Kangal. After losing Luna, they came across my breeders. I had six sisters and two brothers free to choose from. As mom and dad wanted to leave I was sitting in front of the door, and with my magic puppy eyes I said, “Can I come with you, please?” Mom grabbed me from the floor in her arms and right inside her and daddy’s heart. Last year we rescued Chicko, an 8-month old Golden Retriever from a family who divorced. He was on the way to the shelter. That was love at first sight. Now my beloved new brother, mom, dad, my two human brothers, and I are a really happy big family. What’s life like to be a dog in Germany? Actually Chicko and I won the Jackpot! We have the best parents, great human kids, a house and large garden to play, sleep, cuddle and eat in. Mom and Dad never leave us alone at home. We can run and swim unleashed. We get fresh meat for breakfast and dinner and lots of treats. But not every dog in Germany got the jackpot. Our shelters are full. We have a big problem with very sick puppies from East Europe which are sold cheap out of a trunk called “The Dog Mafia.” (Sad face). But most of our friends have nice homes with nice parents and a really good life. Dad started my Instagram account in 2015. On every dog walk, at home, while shopping, or swimming he took pictures. Hard work (just sayin’). And one day the postman brought me my first pupbox for free. Dad told me that I am the most famous Golden Retriever in Germany. Now I have to share everything with my brother. Digging and swimming and eating. I actually love chasing fish in the lake the most. My brother is like Michael Phelps. I sometimes wonder if he is really a dog. In regards to digging: I swear I would never kill a mouse, but it’s so much fun to change your color from golden to mud brown, and that’s always a reason to swim (Dad and Mom call it “washing the dogs”). And we love eating since we both are Golden Retrievers. For us, eating is like breathing. We both love cuddles with the family and sleeping on Daddy’s pillow. My best trick is to jump into Mom and Dad’s bed and get the best place between Mom and Dad on their pillows. Chicko’s best trick is to dive. He is really good at it. Toys, stones, whatever you want he can get from the ground of lakes! Any tips for taking great dog photos? I care about my humans every second of my life. I am a therapy dog, so that’s my job. I feel when someone is sad or had a bad day. When the kids need dog love (even on the dog walks), I give love and am as friendly as a Golden Retriever can be. Chicko, ok his best feature is that I love him. Is that enough? Ha! The founder and CEO of Instagram has a Golden Retriever boy. I would love to meet him. (Side note: the very first photo ever posted to Instagram was of the founder’s dog). Maybe Donald Trump needs some help – maybe to spread some love? Yes, that every dog needs a home and beloved parents. We wish you all a fantastic year! 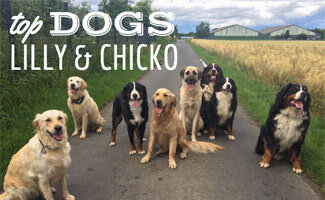 Do you follow Lilly, Chicko or any other Golden Retrievers on social media? Awe, adorable story! Thanks for sharing, will start following these cuties on social media now!